The six-lane speedway known as Sloat Boulevard has been somewhat tamed after Caltrans implemented a road diet last week, reclaiming two vehicle lanes for bicycles. Long known as a virtual no-man’s-land for biking and walking, Sloat is technically a state highway that runs through the Parkside District. The stretch between 21st Avenue and Everglade Drive should be safer now, with new buffered (though unprotected) bike lanes running along the left side of parked cars and other pedestrian safety improvements. This development is especially exciting because this portion of Sloat Blvd is a state highway (CA-35) under the jurisdiction of Caltrans. While California’s Department of Transportation does have a Complete Streets Program, they have a longstanding reputation of prioritizing movement of automobile traffic over other modes of transport. Nevertheless, the agency has gone ahead with enhancements to the safety and comfort of walking and bicycling on this important street and deserve some sincere credit. The bike lanes are seven feet wide with four-foot buffers (seemingly plenty of room for protected bike lanes if such designs had the Caltrans stamp of approval). 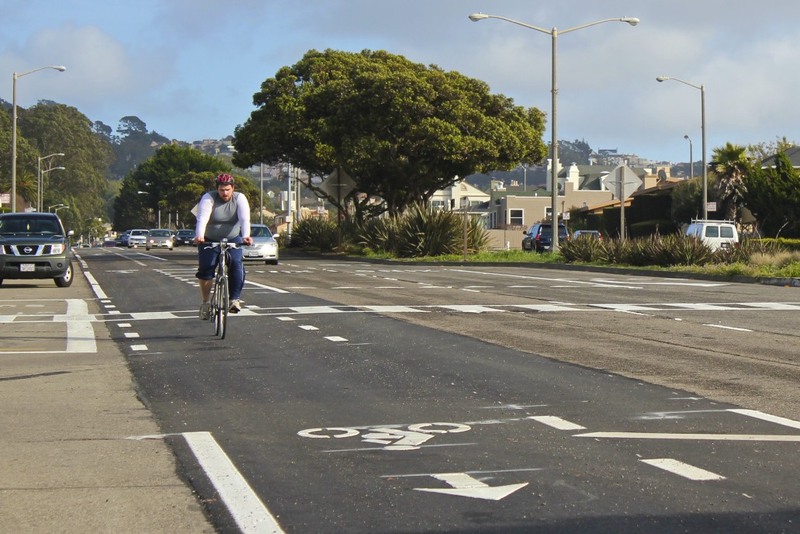 The improvements on Sloat also come with visible ladder-style crosswalks, painted “yield” arrows (often called “shark’s teeth”), and signage instructing drivers to yield. Historically, Caltrans has acted slowly to improve Sloat, particularly at the intersection of 19th Avenue — another Caltrans highway — which is commonly ranked among the most dangerous in the city. Last year, the intersection saw three vehicle crashes in which four people were injured, according to police data. Along Sloat, two pedestrians were hit by drivers last year, and in January of 2010, 54-year-old Feng Lian Zhu was killed by a driver near Forest View Drive. The project was initiated by Caltrans after District 4 Supervisor Carmen Chu requested safety improvements on Sloat, which divides the Parkside neighborhood from Stern Grove and the Sunset District to the north. “Congratulations to both Supervisor Chu and Caltrans for proactively reimagining a dangerous street in to one that makes walking and biking much safer and attractive, helping many more families from the neighborhood and far beyond enjoy the many wonderful destinations in this part of town,” said Kit Hodge, deputy director of the San Francisco Bicycle Coalition (SFBC). 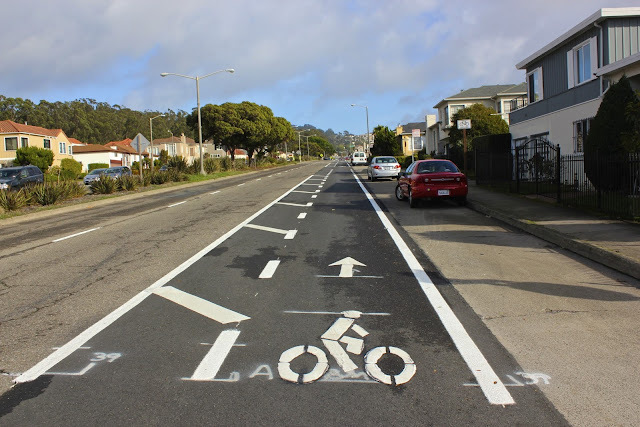 While bike lanes were also striped recently on nearby Portola Drive by the SFMTA as part of the SF Bike Plan, the newest ones on Sloat fall just short of connecting with those and others planned between the Great Highway and Skyline Boulevard [PDF]. No plans to connect the gaps are known as of yet, but the SFBC is encouraging supporters to let Caltrans staff and city leaders know they appreciate complete streets improvements and that more are needed. Gaps in the bicycle route can really discourage usage. Hope they can fix those soon. 1. Smooth road. Sloat was very bumpy before this repavement. 2. Calmer traffic. Hopefully drivers will drive more slowly due to the reduction to two lanes. People drive too fast on Sloat (the speed limit is immaterial). Hopefully the gap between Skyline and Everglade will be closed. Is it city or state jurisdiction? State jurisdiction, I believe. CA-35 flows down Skyline Blvd south to Daly City. I think the best part is that they repaved the bike area. Why would they stop at those locations? Clearly, there is little consideration by Caltrans of the actual needs of cyclists. This was a car safety project that happened to have a bicycle component. It’s a decent infrastructure (although it should be protected, given the 40mph+ traffic whizzing by), but it is highly indicative of how Caltrans views cyclists and cycling in general – an afterthought. They would never build a highway that only existed for 0.65 miles and didn’t connect to any other highways, and had no plans for expansion. That kind of thinking wouldn’t make sense and neither does this half-project. When you think about it, San Francisco has a lot of very wide streets, for better or worse. Incredible things could be done with this space, once you get past the idea that every square foot must be devoted to the fastest possible movement of cars. You could build a fantastic 8-80 bike network, plant trees, and generally turn them from traffic sewers into great boulevards. I love this. My usual workout involves a bike ride down Great Highway, around Lake Merced, then up Sloat to Sava Pool. The sidewalk on Sloat is all cracked and the bushes are over-grown. I used to ride up the north side instead of the south side because of all the stop signs and oblivious drivers. Plus, I’ll admit to being guilty of speeding along this stretch my whole life. (I worked at that Big 5 in high school) I’ll probably slow it down now that it’s two lanes. Very glad to see this, now, continue on with the rest of SF. As a driver, I don’t mind it. Driving on Sloat is part of my normal commute, however, I did see a few cars just today driving along the bike lane. I should think the residents that live along Sloat would be glad the “Sloat Freeway” is being tamed. 2. The connections to the bike network badly new completion. Caltrans, I’m so impressed by this project; I bet you can finish it right! 3. Has anyone else tried the new Portola “lanes”? The final half mile or so westbound (downhill) is all sharrows, but perhaps a better term is “harrows”. SFMTA expects you to take the lane on a fast-moving highway, when there’s an empty parking lane right next to it that they easily could have turned into a protected bike lane! It really is a pretty atrocious facility at present. Check it out, folks. Kwbb – right on Vicente, left on West Portal, Right on Sloat. You have to cross the LRV tracks on West Portal but that crossing is better than the crossing at Junipero Serra. You also bypass the light at Portola/Junipero which has a lot of confusion to it. That Portola parking lane is largely for long-term vehicle storage (or it’s empty). I guess that trumps a safe bikeway..
Buffered bike lanes? Really? And a simple Sharrow wasn’t used because? This is a joke, right? Folks who are afraid to take a lane on a 40 mph street? Incompetence. And this business of putting the cyclist as far right as possible is the worst possible design, amplifying all that’s wrong with bike lanes. Debris havens, reduced visibility. California cyclists amaze me. CalTrans stupefies me. Vehicular cycling = 1-2% of population cycles. Protected bike lanes = 70% of population cycles. I am beginning to think vehicular cyclists really, really, really want most people in cars rather than on bicycles. Frankly, I would rather see the buffered zone on the side of the parked cars. The door zone (roughly 5 feet wide, to allow for a “no-swerve” path by cyclists and allow for the width of both car doors and bike handlebars) represents a far greater hazard to cyclists than the cars traveling 40 MPH to their left. My other concern is that cyclists riding 5-6 feet to the left of parked cars (to avoid car doors that are often almost 4 feet wide when opened) will be riding on the extra paint in the buffer zone, which is a more slippery and hazardous riding surface than plain asphalt. That said, road diets are a great idea and the wider bike lanes–regardless of how they are striped or divided–should help make the roadway safer. Just came back from a Sunday afternoon visit to Ocean Beach and rode up Sloat the whole way home. I give my full stamp of approval to the portions of Sloat which were repaved and striped with a buffered bike lane, but the lack of connections on either end of the project is completely deplorable. Coming from the west, it was very difficult to take the lane (sharrows don’t help in the slightest) and the pavement condition is horrible. The comment of someone driving behind me sums up the experience: [pulls up next to me and rolls down his window], “I’m about to cut you off”. First off (and I know this is not a Sloat issue) the mixed use path on the Great Highway was problematic. Lots of joggers, walkers and bicyclists out, which was fabulous! They were all saving me money by being active and avoiding diabetes, and I applaud them every one. However, not unlike the Panhandle mixed use path, there is not enough room for all these users. There could be–it wouldn’t take much to widen that path another few feet. Then Sloat. No bike lanes by the zoo! Not so much of a problem since traffic was light, as was parking. I was able to ride mostly in the parking lane. When the road met up with Skyline I had to make a frantic dash for the right-hand side of the road across two lanes of traffic with cars coming fast. A bit unnerving. Then I was on the bike lane. On the whole pretty good, especially since again parked cars were sparse and riding in the parking lane meant more distance from noise and toxic fumes. Like John Spangler below, I would *love* for the bike lane to be between the curb and parked cars. This is especially true for the several blocks I had to fight an aggressive Muni bus. It’s not entirely the bus driver’s fault–the poor man had to stop literally every other short block. It was ridiculous. The bus would pass me, then pull over with its nose just across the bike lane, its rear blocking both the bike lane and most of the lane of vehicle travel. I would pass it, usually by going around to the right where there was plenty of room because the bus hadn’t pulled over much at all. (I suppose this wasn’t exactly legal, but the other option, pulling into the left-hand lane of vehicle travel, was distinctly unappealing given my ten-mph-going-uphill speed.) When I was ahead of it by half a block, the bus would again pass me and twenty seconds later do the exact same thing. Eventually there was one stop where no one was getting on or off and the bus was able to stay ahead of me for good. If the bike lane had been to the right of parked cars and the bus stop, as bike lanes are in the Netherlands, all this conflict would have been avoided. Then, a few blocks short of 19th, the bike lane ended! Traffic at that point wasn’t too bad, but as I waited at the light at 19th, I dreaded how to manage the next three blocks to Portola. I was beginning to seriously regret not having taken Vicente. My dread was for good reason. Harrowing is the most positive word I can give to the whole ordeal. (Mark Dreger’s assertion below of “completely deplorable” is also apt.) When the light at 19th changed, I stayed to the right initially and let the traffic behind me pass. Then, with an empty road, I moved to the left and made my way towards the monster intersection of Sloat/Portola/Junipero Serra. I delicately edged between cars in lanes 3 and 4 (counting from left), getting myself positioned at the front, just before the crosswalk. (The light is so long at this intersection that it still hadn’t changed.) I could see the bike lane on Portola; I knew where I wanted to go; but I had thirty impatient drivers behind me, Muni tracks and a large intersection in front of me. The light turned green. I sprinted (as well as a fifty-year-old woman with flowers on her basket is likely to sprint) and reached the bike lane with no one honking or yelling, though they did roar past me as soon as I was out of their way. On my way up Portola, there were again few parked cars, so I was often able to ride next to the curb and away from traffic, making me happy. Though Portola is a long, long hill, it’s not impossible by any means, even for me. Getting through the Woodside/O’Shaughnessy intersection was unpleasant, as usual, avoiding traffic desperate to exit the shopping area and then traffic trying to simultaneously get around me and merge before the bike lane starts. But once I hit that buffered protected bike lane, it felt absolutely great. A short time later I was off Portola, going down Clipper, hill accomplished, almost home. widening the path is a no-go. It would be widened by paving over the dirt shoulder favored by runners. This is truly a recreational trail – by that I mean that there is a very good “transportational alternative” (as opposed to paths I use that going slow means being late to work or riding on the freeway). What is the transportation alternative? I saw a couple of very fast bicyclists on the road with the traffic, but there’s not much shoulder. Is there a bike lane I missed? Biking on the Great Highway is not too bad. There are few intersections and most collisions happen at intersections. The road is straight and wide open, so cars coming up behind you can easily see you and go around. You can also bike on the frontage road between Sloat and GG Park. The frontage road has slower speeds and less traffic, but also more intersections and lots of parallel parking to hide you from cars, so it may not be more safe than the highway. I’m yet to be hit from behind by a car travelling in the same lane, and I’ve given them decades of opportunity. Knock wood. Sloat “Harrowing”? “Deplorable”? Get a grip! Karen – you can take the Lower Great Highway. Richard – since you’ve given an anecdote – here’s a rebuttal. 400 yards of clear visibility mid-afternoon between me – riding dead center in the lane – and the car behind me. And he drove straight into me, hitting my rear wheel with his license plate. My 8 year old is perfectly numerate, thank you very much! But I see your point. 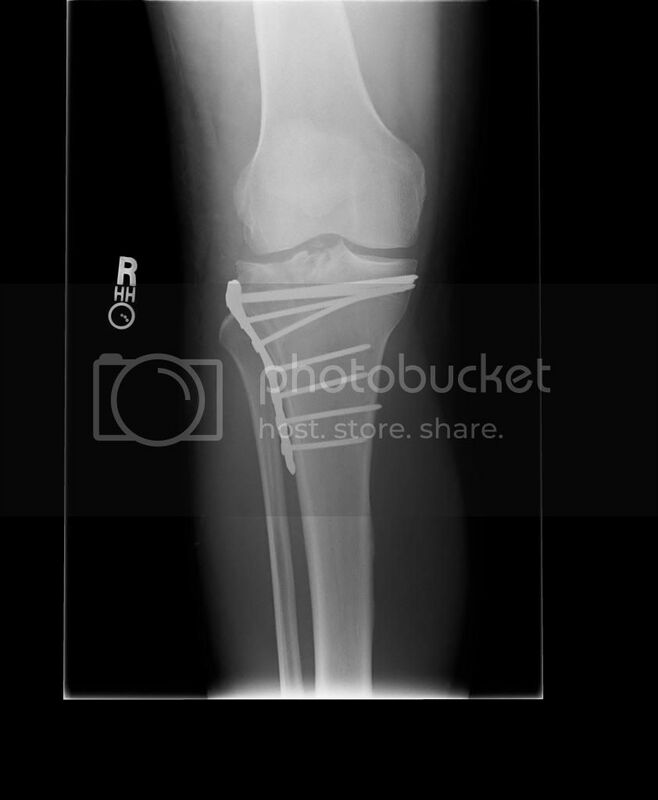 Bike lanes (especially separated bike lanes) are bad because here’s a picture of a broken bone.